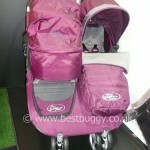 The Baby Jogger City Mini has two carrycot options. 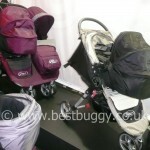 There is the hard cased bassinet / pram carrycot, and the compact carrycot. These photos show the two options. As the photos clearly show, you can definitely fit the hard carrycot on without the fabric, and the compact carrycot fits on with the hood and fabric . 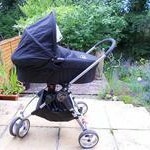 My understanding is that both carrycots will fit onto the chassis, with or without the fabric – but please check this out. The advantage of the compact carrycot is that you can pull both the carrycot and pushchair hoods right over the top encasing the baby in winter or to give shade in summer. But the compact carrycot has soft sides. However I believe it can collapse for travelling. The compact carrycot measures 28cms wide by 78cms long approx. 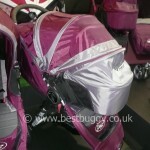 The hard carrycot, as the photos show fit two ways on the City Mini – either using the car seat brackets or by fitting into to a car seat adaptor on the socket below the hood socket. 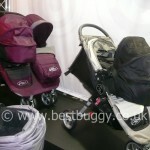 The last photo shows the three brackets that come with the Compact Carrycot. 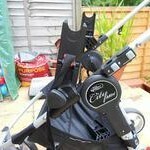 The thick “pin” brackets on the left are those which are used on a single pushchair eg City Mini, City Mini GT or Elite. 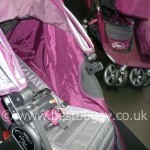 The thin “pin” brackets on the left are used on a 2011 or newer double pushchair along with the flat red indicator brackets used at the bottom of the photo. 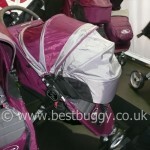 On a double pushchair in twin mode, the hoods are both removed. 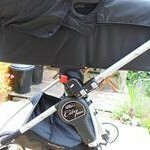 The thin “pin” brackets then get plugged in on the outer sides of the pushchair where the hood used to be. 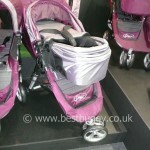 The two flat brackets are then put in the inner hood sockets in the middle of the pushchair. 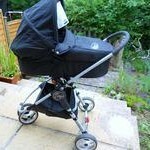 For one carrycot mode. Only one hood needs removing, and only one “pin” bracket and one flat bracket is used. 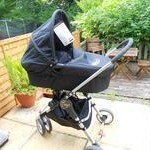 The last photo shows how the fabrics can be removed – on a single or a double City Mini, GT, Elite or a Summit – and can have a Compact or possibly a Compact Plus (single pushchairs) carrycot added to form a great looking pram for a newborn baby. 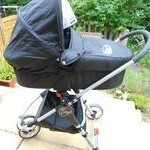 Thanks to allthefires for her photographs of the hard carrycot on her Baby Jogger City Mini.